A FAMILY is lucky to have survived a freak incident which has, in the past, claimed lives. And now police are warning road users of the serious risks and financial penalties that failing to secure a load can have. 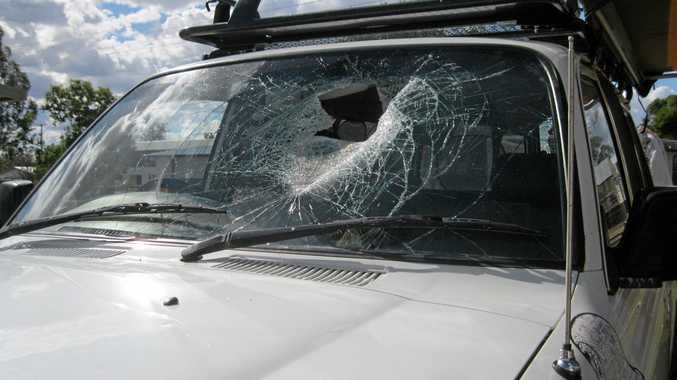 The family was driving east on the Warrego Highway when, about 1.30pm on Thursday, they narrowly avoided death when a brick which fell from an oncoming truck bounced off the bitumen and smashed through two windscreens. The projectile narrowly missed the male driver, 48, his wife, 42, and their eight-year-old son in the back seat. The brick smashed through the LandCruiser with such force it ripped a hole in the bonnet and roof, and dented a trailer being towed behind. The mother and son were taken to hospital for treatment of minor injuries. Darling Downs Acting Superintendent Stephen Angus said previous instances in the region had, tragically, resulted in fatalities. "Objects falling from vehicles and, in this case a brick, have the potential to cause some very serous injuries or potentially death to occupants of vehicles impacted," he said. "Most people might not be aware the drivers of commercial vehicles, and that includes normal utes ... are required to have cargo nets fitted to the back and trailers for the purpose of securing the contents." He said it was a timely reminder for families planning to travel during the upcoming school holidays to ensure loads were secure. It follows an incident on the Gore Highway on Wednesday night when a driver struck a hay bale that fell from the back of a truck near Millmerran. Phone Policelink on 131 444 with any information.